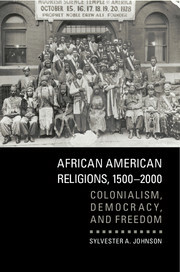 Sylvester A. Johnson, the author of African American Religions, 1500-2000: Colonialism, Democracy, and Freedom (2015), explores what Black history reveals about the larger state of national security and American Islam. As the 2016 presidential election campaign of the United States has progressed, we have seen increasing consternation over Islam and national security. At least one presidential candidate has called for banning Muslim immigration to the United States and investigating every American mosque. A number of White Christian militants, openly carrying military assault weapons, have even begun demonstrating outside of mosques, touting their weapons as the cure against the threat of Islam. Islam has existed in the Americas for several centuries (Muslims first arrived in North America with Christopher Columbus in the 1400s). As many enslaved Africans were Muslims, their forced removal to the Americas made Islam a permanent part of American religion. Since the twentieth century, both conversion and immigration have ensured an expansive and diverse population of Muslims in the United States. Despite this, both populist and governmental attitudes reveal deep and lasting antagonism toward Islam that renders Muslims as somehow alien to true Americanness and even as a threat to the nation. How might Americans begin to make sense of the current plight of hostility toward American Muslims? The answer lies partly with understanding important dimensions of Black history. The dynamics of American Islam and national security began with the FBI’s engagement with African American Muslims in the early decades of the twentieth century. Until immigration reforms of 1965 dismantled steep barriers to non-European immigrants, African Americans constituted the majority of Muslims in the United States. That has now changed, so that American Muslims are more racially diverse. Nevertheless, the older patterns of engagement between the nation’s chief arm of domestic security (the FBI) and African American Muslims have produced indelible influences. So, what does Black history reveal about the larger story of national security and American Islam? In this excerpt from African American Religions 1500–2000, I explain the relationship between the Federal Bureau of Investigation and African American Muslims by discussing a 1950s training manual the Bureau developed to prepare its agents to engage African American Muslims. This history reveals a persistent and substantial gap between the religious lives of these American Muslims and the perception of threat that shaped domestic security paradigms of surveillance and counterintelligence tactics of repression. The sections of the book that follow this excerpt explain fundamental shifts in the nation’s architecture of counterintelligence that not only survived the intelligence reforms of the 1970s but also flourish today on a scale far beyond what existed previously. Interpreting this complicated history of race, religion, and national security practices is essential to understanding not only the history of African American religions but also the forces of race and democracy that lie at the heart of political conflict in the United States.